Pablo Bronstein's dance Vitrine and Craycrofts wall drawing/sound installation. Tara Mateik's Men with Missing Parts, and Craycrofts slide show. Alex Waterman's The Night Driver and Craycroft's video animation. Staging the Phenomenal Character was an exhibition involving 6 performances – by Jill Magid, Tara Mateik, Pablo Bronstein, Alex Waterman, Felicia Ballos and Ohad Meromi – and 6 installations by Anna Craycroft. Each performance took place in an empty gallery on a given day. Each installation was installed in the space – in response to the previous performance – on the following day. 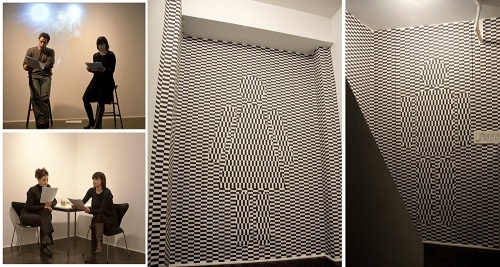 These installations interpreted the previous event through the psychological impact of perceptual phenomena, using optical, aural, and spatial illusions as the primary medium. Angie Keefer designed the booklets that accompanied the evolving project.